Jacob Benjamin Cochran was my dad's grandfather. He was born in 1822 Ohio and was in the Civil War. His grandfather Alexander Cochran of Pennsylvania was in the American Revolution. Jacob married Clora Jane Miller about 1879 in Iowa and had Frank Delbert when they settled in Hill City Kansas. Frank D. married Luella Coonfield in Arkansas and had my Dad in 1927. Luella's family came from Kentucky, her mom was Lattie Cedonia Little, a daughter of John Wright Little and Catherine Crigler. Catherine's parents were Catherine Roby and Abraham Crigler. The Coonfields were in Kentucky by 1800 and so were the others. Meanwhile in Alabama about 1826, Peter Bozeman settled in Hope Hull and all along through Ramer and Dublin were found our Elisha Anderson, Abner Broadway, Calvin Sellers, John Stephens, and after the Civil War came Josiah Marion McClain. About that time John Fenn settled in Tuskegee and had a son William Franklin Fenn who married Anna Lou Stone in 1893 and had a son Cecil Earl around 1900. William worked on his uncle Matthew Fenn's plantation in Eufaula but Anna divorced him and left about 1901 with Cecil. Her parents were born in Macon County, Mary Ann Hendrick and Augustus Marvin Fenn. In 1861 Peter Edward Bozeman married Nancy Jane Anderson and worked their 40 acre cotton farm in Dublin. His mother was Martha Hill born about 1800 South Carolina and they lived near her brother John Hill, who created Hills Chapel, the church, the school and the cemetery. It is possible that their father the elder John Hill once lived there as well. Nancy's son John Thomas Bozeman married Alice Lorena Stephens and she had Lorena Emma Bozeman in 1890, and Ethel Mae about 1892. Alice died birthing a son in 1894. Then John married Sarah Ellen Bean and several more children came including our Uncle Bob. Lorena married Charles Allen McClain, the son of Elizabeth Broadway and Josiah McClain. Josiah was born in Georgia to "Anna" and James McClain. James' grandparents came from Virginia in the 1700s, Elizabeth Moon and Charles McClain, found in 1800 Spartanburg SC. Lorena McClain had Alice and she married Cecil Earl Fenn Carter. His mother Anna Lou Stone Fenn had remarried and gave him the Carter name. Cecil had served several years in the Army in El Paso but returned after his mother died and stayed in Montgomery near his sickly father Wm Fenn who had left the farm and retired near the train station with most of his other children who began to work for the railroad. Alice and Cecil lived on Columbus Street and had three children including my mother born in 1934, Anne. Anne grew up to marry Frankie Cochran. Anne's daughter married Charles Brooks. His family also came from downtown Montgomery around 1900 where his grandpa James E. Brooks worked for the State, but his daddy worked for the railroad. James was the son of Annie Ballard and John Brooks of Tennessee and he married Susie Mae Cooper, the daughter of Sarah Elizabeth Carter and Levi Benjamin Cooper. Susie named her son James Jr and he married Mary Ella Thornton who's ancestors are found in Elmore County in the 1800s. Our ancestors met before the Civil War. They came together in Montgomery sharing cotton plantations in the fields you now see when passing through Montgomery on I-65. Yet after the war this land was worthless, being destroyed as Wilsons Raiders burned a path through the state but these families struggled to revive as much as they could. I found an old cemetery with some tombstones dating back to 1793 on this property and then tried to trace their descendants across town. In 1900 I find them again in downtown Montgomery near the train station as many others had migrated into our lineage and they once again worked together. In fact my mother in law in 1950 had taken in the widow of my great grandfather when she had no place to go. My husband's cousin Sue Carol on his mother's side married one of my mother's Bozeman Cousins and his father's great grandpa Thomas Carter was once married to another of our Bozeman Cousins in Hope Hull. Our families were always close, we just did not realize how very close. My father came from Kansas and married my mom in Montgomery in 1951, while he was stationed at Maxwell AFB after injuries from being shot in the Korean War - his lineage was partly in Pennsylvania and South Carolina before migrating into Kentucky and Ohio and then on into the midwest. Together we have dozens of grandfathers in the American Revolution and the Civil War. Was your grandmother native american? Elizabeth Grauer Westbrook Lawson . Brooks and Cochran Family .Notes . Websites Of Interest . files . Coonfield Interview . Webpages . My Family . Enjoy!! . Webpages of Interest . Resources . Bits And Pieces . Links . Pioneers of Montgomery County . Feel free to contact me if we are related. .I have uploaded records, photos, documents to the web and most can be found through the searchbox below if the links still work. Some servers keep changing things around and items get lost but eventually if you search within http://www.usgenweb.com/ the information will appear. I had once posted on aol hometown pages but after ten years of hard labor, they deleted that server and so did rootschat.com, so while the freepages are available they do hold a lot of wonderful genealogy, but once they are gone, so is our work. Her mom was Caroline M. Bond, daughter of Mary Catherine Stone and John Baptist Bond from 1700s North Carolina History....Our grandmother Caroline married several times, here with Mr. Dunham but she has her two children with her Roxi Smith and John Smith and possibly her own mother Mary Catherine Stone from North Carolina who has obviously remarried too...........Three generations on this document ! Locating others online researching same. Since her sister was my great grandmother and Ethel had many surviving but elderly children in the Dublin and Ramer Communities, I located and contacted a few for information. I managed to meet several of Ethel's descendants in May 2007 at Hills Chapel Church which was a marvelous gathering of cousins. We exchanged research and took many photos. Elizabeth and her daughter researching our ancestry of Grandpa John Thomas Bozeman. Tracing our roots and branches. His will is found probated in Montgomery, mentions his wife, daughters and son Elijah - Elijah had our Seaborne Montgomery Anderson who had Nancy Jane. Seaborne had a brother named Elijah who died in the Civil War 1861 and home was listed as Hickory Grove. Hickory Grove is also where our Grandpa McClain lived. Some researchers think that Elisha Anderson was the son of Elmore Anderson and a full blood indian all born in 1700s North Carolina, near the Sellers and Pool families who were also of mixed blood. 1821 Several indian villages were found like Sawonagi and indian burial mounds still exist in that area. One clue after another as we follow their trails. Montgomery Transcription has my Abner Broadway, John Carter, Daniel McQueen, Lewis, Stokes, Ross, Gunter, Hill, Bozeman, Graves, Anderson, Sellers, Johnson, Mills, and many others, including George Bush and a John Booth, of course the John Wilkes Booth you've heard of actually performed in a theatre downtown Montgomery. There are actually some old fish ponds in south Montgomery County where you know who George Bush comes to go fishing with old friends..........So very many of their children and grandchildren were intermarried, that we may all be cousins way back when. All up and down these old country roads, were once our family plantations and some graves were recently found. Jimmy Ray and Alan's DNA test to the local Bozeman family is a perfect match. Our connection to cousin Wayne Bozeman through Grandpa William Henry's son Meade. Meade was the brother of our Peter Edward whom we found buried at Dublin. Richard and William researching the Montgomery families is also cousin to Wayne of Elmore. Ethel Bozeman married J Gibson, the son of Clopton Gibson and Rebecca Lou Broadway ( Grandma's sister) they lived in Dublin/ Ramer Community, after you leave Hwy 231 which is known as Warrior Hill Road. Sharon is researching William Henry's other brother who married Gilly and moved to Louisiana and died in 1851 of the cholera. This tiny home was built by Aunt Ethel and her husband Jace Gibson and my picture was taken when my sister Pam and I visited the area around 2005 after hearing the story from her daughter Peggy whom we lost not long afterward to kidney cancer. Peggy's story was that Ethel and Jason had several children at the time, all living in a tent on this farm, while they built their new home around 1930. It seemed to be one of the oldest homes still standing in 2005. Ethel and Jace are buried down the road at Hills Chapel Cemetery on the Long Road close to her father John Thomas Bozeman and his 4th wife Sara Ellen Bean. Sara raised these children after their mother died young and told them stories, like she was related to the hanging Judge Roy Bean. She was a wonderful stepmother who also gave them four more siblings before she passed away. Many of these descendants still remain in Dublin, Ramer, Grady, and Hickory Grove. His mother was Hazel Richards, buried at his foot. April 1896 Grandmother Nancy applies for Peter's pension the first time. Married in SC Peter Bozman left in 1826 for Alabama. Describes my family very well, faith and loyalty got them through the bad times. Type in your last name and find your families!!!! Not mine but my Hiram Little moved there in 1860 so are we connected. John Little was born in Kentucky 1843 to Catherine Wright and Hiram Little. They fail to mention he was mixed Scot with Indian Blood and the possibility exists that this man traveled back and forth visiting family in Georgia or Virginia, nobody knows the true facts of his entire life, nor the possibility this man who fathered Red Eagle may also have fathered Catherine Weatherford who married John Wright. Virginia born the Fenns ventured into Georgia, into the War of Independence and beginning their plantations. Daughter of Catherine Roby and Abraham Crigler was married to John Wright Little; She was born and died in Bullitt Kentucky. Afer her death John moved their family to Arkanas and soon after, her father followed him. They are Cherokee by blood. Lattie Little about age 16 born Kentucky, Cherokee by blood. William Little born Kentucky, Cherokee by blood. Sam Little born Kentucky, Cherokee by blood. Lattie Little had Luella in Arkansas - Cherokee by blood. His father served in WWI, his brother died in Korea, his grandfather served in the Civil War and some served in the American Revolution. Frankie was one eighth Cherokee blood. she has children in the home and could be Catherine's mother - she could also have been a wife of the famous Charles Weatherford; nearby is a younger Charles Weatherford who might have been her son.....Patsey Weatherford is one to be researched. Virginia Documents state that her father was Charles Weatherford - scroll down to #76 where Benoni Smith was her surety to marriage - was her father in Alabama with his other family? Abraham Crigler and Lydia had Owen. Owen then named a son Abraham who married Catherine Roby and had Mary Catherine Crigler who later married John Little. into Rhode Island and Mass. The son of Jonas married Catherine Wright ( daughter of Catherine Weatherford) and named a son John Wright Little in 1843. John is later found living with Abraham Crigler because his mother died and Hiram moved to Texas and remarried. Abraham Crigler's wife was Mary Catherine Roby, the daughter of Reason and Catherine Simmons Roby. Reason was the son of Lawrence Roby and a lady named "Catherine" who is shown widowed living by Reason in 1820. Charles married Elizabeth Moon about 1750 in Virginia and moved to Spartanburg SC. His son Josiah married Nancy Wood and had James. James married a woman only known as Anna and they are buried at Indian Creek Cemetery in Georgia. Anna's son Josiah Marion McClain had a family in GA, left for the Civil War and never returned. He had a second family in Alabama and one son named Charles born 1886. Parents of Catherine Simmons were Jesse and Rachel Wells Simmons from Maryland into Kentucky. Rachels's father was Jacob Wells. Parents of Jesse were Elizabeth Swearengin and Johnathon Simmons of Maryland. Links to other great research. Found in Kentucky 1800 and many descendants began a migration west. Reverend Alexander Miller had many descendants begin a migration west. Migrated south with his Cherokee wife and children. Vast lineage of plantation owners migrated south. My dad's GGG grandfather from Scotland along with several possible brothers, in Union County South Carolina 1790 and 1800 census but in Kentucky 1810 after the brother of Mrs. Mary Handley Douglass Little explored, surveyed and offered them land in Vienna Kentucky and more along the Green River which is included in the books History of Kentucky and mentions these familis and is included in the Kentucky Genealogy Webpages. Military Record 1863 Kentucky Infantry, then Bullitt County Kentucky and later in Madison Arkansas. Also John's father was a surgeon in the Civil War....many of this family served. Sterling Campbell married one of the daughters of Peter Bozeman in Darlington SC and followed the families to Montgomery and later bought land near Talladega. Sarah's X mark - Vincent married Ellen Bozeman, a daughter of Peter, and later bought land in South Alabama. Vincent also signed documents for Peter in 1822 and 1824 as his child Julius received a gift of land from Grandpa Peter. Most could not read nor write so the spelling varies through time. Census study shows them as native americans in Alabama. Item 76 states she is the daughter of Charles but he is not making her marriage bond so he must have been in Alabama. Some old images in my collection. Go to Little and see Catherine who married Hiram Little - She is the daughter of Catherine G. Weatherford and John Wright. Hiram was a physician and the son of Jonas, and the grandson of George. Hiram and Catherine had a son named John who is listed below their article. John's granddaughter married Frank D. Cochran. Most of these had fathers in the American Revolution - so many connect to me. Her families and descendants in census notes. By 1850 she had settled near the other Hills in Dublin and some families in Ramer who connected to her vast lineage. Anna Lou Stone married Fenn and Carter and Dasher and died around 1933 or 1934. Her father was born in Macon County AL and moved back to Macon GA before he died. She followed. The death certificates of both of her parents are found in the Georgia Archives and Annie signed as a witness to her mother's. Study of William Henry Bozeman born 1802 Darlington and their trails into Hope Hull. 1793 Brother of W. H.
John Hill in Darlington SC before the great migration. Mt Hebron Primitive Baptist Church Cemetery is very small. George Thornton and wife Mary Angeline Partridge graves are found here. Emily Alice McClain's father stands with her brother. Charles McClain's parents and grandparents spent many years in Creek Territory. Stokes-Carter Cemetery has no official name, no Stokes buried here, mostly Carters and Bozemans. Tombstones being trampled and damaged by the cattle and falling trees. Coosa River Primitive Baptist Church has some of the original settlers of Holtville born about 1800. Anne's father was born around 1900 - nobody is really certain - at Thompson Station in Bullock County - born to a Fenn family he was adopted around 1910 when his mother remarried in Macon Georgia. His father was from Tuskegee Alabama and grandparents from former Creek Territory in Georgia but he claimed to be Cherokee blood. Enlisted in the Army about 1920 to 1930 stationed at Fort Bliss in El Paso. Found his father living in Montgomery Alabama and returned about 1931. Dublins' old cemetery behind Hills Chapel hidden far off into the woods. born 1896 at Thompson Station in Bullock County - died in Coosada on his farm at Airport Road where the school now sits. His grave is on that land he had donated to the church for a cemetery. Frank worked for the railroad, his wife boiled his dirty clothes in a pot outside - he was in WWI and hauled POWs on the train. Dublins'new cemetery for the public is across the street from the front of Hills Chapel. Left Iowa for Kansas Territory after 1880 with son Frank Delbert Cochran on the left. Memorial has many of my relatives' resting places - land donated by Lorena Bozeman's Uncle Robert Henry Bozeman - located between Maxwell AFB and Hope Hull and Pine Level. Arkansas - she is in the center of this photo just before she married Frank Delbert Cochran. She is Cherokee by blood. Her mother was Lattie Cedonia Little of Kentucky. Shepherdsville, Bullitt County, Kentucky - Lattie Little was born to Mary Catherine Crigler and John Wright Little. Dublin Old Cemetery behind the church - Alice Lorena Stephens Bozeman, the Cherokee in grandma's lineage. Dublin Old Cemetery behind the church - Peter Edward Bozeman of the Civil War - the clover design is a separate layer added to this homemade tombstone with penciled PEB our father added. Lucius Powhatan Little was Lattie's cousin in Kentucky - he was a lawyer, a judge, a writer, and a genealogist. They all had one common grandmother from Virginia, Catherine Weatherford. Martha Frances Young of Kentucky married Benjamin Wylie Coonfield in Indiana. Their hair was so black that it looked blue in the sunshine. Born in Kentucky to Nancy Catherine Roby and Abraham Crigler, she married John Little and had Lattie and Sadona in this picture. Old Harmony Primitive Church Cemetery has few graves but includes Elijah Lee born 1777 and his wife Malinda Phillips who came to Chambers County before 1830 buying land from an old Creek Indian and they are the great great grandparents of Susie Mae Cooper Brooks. T R Carter with his first wife and family - he is great grandfather of Susie Mae Cooper Brooks. Frank Delbert's brothers and sisters. grandmother to Charles Wayne Brooks known as Mamaw. Her mother was Sarah Elizabeth Carter who married Levi Benjamin Cooper, a son of Charner P. Cooper of Chambers County. Emily Alice McClain was married to Cecil Carter and she died at the age of 19 after giving birth to her third child. next to Jesse and Sterling Campbell - William Henry was the son of Rev War Patriot Peter Bozeman who owned several acres in Montgomery Alabama and brought his family here from SC as an early pioneer when Alabama became a state. his son in law Thomas R Carter was administrator of the estate - Jesse was the son of Rev War Patriot Peter Bozeman who was a son of Mordecai. Jesse was married twice and adopted his second wife's child Sydney. Most of these families are buried in Hope Hull's Carter Stokes Cemetery just off I-65 in Montgomery, on US 31 South you simply turn onto McLean Road and you can see the small mound by the pond and it's many headstones which are not protected from the cattle nor the falling trees. Mordecai, Peter, John and who was PAUL?? Alice Emma McClain married Cecil Carter and she died at the age of 19 giving birth to their third child. Alice Emma McClain had Annie in 1934. Great granddaughter of Alice Lorena Stephens and John Thomas Bozeman. Walton McClain holding Anne, his niece. Grandson of John Thomas Bozeman and Alice Lorena Stephens - of Elizabeth Broadway and Josiah Marion McClain. Anne Carter married Frank Cochran who was the grandson of Clora Jane Miller and Jacob Benjamin Cochran - and of Lattie Cedonia Little and Benjamin Wallace Coonfield. Lorena's great great grandfather in the American Rev sold his land in 1826 and moved to Hope Hull, in Montgomery County, Alabama, wrote letters found in the Archives in 1828 claiming to be injured and an invalid but they had no proof and rejected his claim but he managed to get his land in Alabama which was sold and divided in 1838 according to the documents in Alabama Archives. brother of John Thomas, son of Peter Edward and Nancy Jane Bozeman in Ramer. Alice Lorena Stephens Bozeman - The family story is that her great grandfather John Stephens served in the American Revolution in North Carolina and married a full blood Cherokee woman, gave her a Biblical name, and due to Indian unrest they migrated into South Carolina and then Alabama. John named a son John who married Jane Tillman and they were proud of his Indian blood, shared stories and the sons loved music and art. Son of Anne Carter and Frank Cochran was the grandson of Luella Coonfield and Frank Delbert Cochran - and of Alice Emma McClain and Cecil Earl Fenn Carter. Lorena's granddaughter by Alice Emma McClain Carter, - Anne was the great great granddaughter of Nancy Jane Anderson and Peter Edward Bozeman - and of Mary Ann Hendrick and Augustus Marvin Stone- and of Emeline Harrell and John Fenn. Lorena's father born and died in Ramer, John Thomas Bozeman was married to Alice Lorena Stephens - Whomever placed his tombstone had it inscribed "Estimated Age"
Grandpa Brack - descendant Lavinia Jane Brack Sellers to Nancy Jane Anderson Bozeman - Grandpa Brack had married Hester Doty in North Carolina 1700s. Great grandma was the daughter of Alice Lorena Stephens and John Thomas Bozeman, born 1892. Interesting reading - I had been told that a Wm Fenn married a Mattie Mae Adkins and my grandpa Cecil was close friends with them. The son of Mordecai born around 1755-1758 had sons named Jesse M, Peter E, William Henry and a daughter Lucy Campbell. They moved to Montgomery Alabama around 1827 and Peter died around 1829. Peter had been paid for his service in the SC Continental Line of the American Revolution but thought he had earned something more when he moved, perhaps the Land Grant, but was possibly rejected because of a dead line setup by the government, but he did write about having a certificate, one that we have not yet discovered. Phillemon descendant to John L in Covington, and William E.
Peter Bozeman, born 1758 son of Mordecai moved to Hope Hull. William Arthur Stone, our cousin from Macon Georgia, played one season with the St Louis Cardinals. on census with parents Mary Ann Hendrick and Augustus Marvin Stone, has a brother Arthur. Daughter of Mary and Thomas R Carter - mom of Susie Mae Cooper shown standing. The letter reads: "I give to Adaline Griffin thirteen head of stock Cattle and mark and brand mark crop and half cross in the left year [sic] and two under betts [?] in the side Recorded by me and brand A G." Apparently, Fenn was out of town, and so addressed this letter to himself, and the Post Master at the General Store (or such) in Bainbridge had probably been told to open his mail in Fenn's absence, and the Post Master took this to the courthouse, where the county clerk signed noted it "recorded" and signed it "A.D. Smart, Clk." Decatur county. It's a quarter of a full lettersheet. Maybe there was a shortage of paper, or there was other writing that was torn off and long gone, who knows. Postal marking cover is all there. spouse of Mary Angeline Partridge, found in Central, Elmore County, AL at the Mt Hebron East Baptist Church about 5 miles from the caution light. spouse of George W Thornton, found in Central, Elmore County, AL at the Mt Hebron East Baptist Church about 5 miles from the caution light............Mother of Milton Elijah Thornton who had married Bessie Mae Hood - Grandma Partridge was an Indian from Georgia - possibly Creek indian by blood. Tracking the roots and trails of the old ones. Lived near Martha Hill Bozeman of Dublin and the several Stephens families, Gibson, and Hill and Rushton. Anna's mother was Mary Ann Hendrick, the daughter of Christopher Columbus Hendrick, who was only in Alabama for a short while. before moving on to Texas while the new land was for sale really cheap. The Stones however returned to Macon Georgia. Anna's first husband, William Franklin Fenn's ancestors came from Early and Decatur Georgia. Anna later married Mr. Carter and then a Mr. Dasher, both need further research. Her son by Fenn was called Cecil Earl Fenn Carter, so she must have remarried while he was still a very young child. Had six children with William Franklin Fenn during her seven years of marriage. She left him in Barbour County Alabama with the children, taking only the baby and moved to join her family of Stone in Macon City, Bibb, Georgia. There she remarried and gave the baby the name of Carter. Little baby Carter told his family that his grandfather was a full blood Cherokee Chief. Of course young Carter was a tall handsome dark man like his siblings, but he did drink too much, so the chief part may or may not have been fantasy. The Fenn boys were tall, over 6' and very dark. The Carters, Stones, Fenns were all in 1700s Georgia in Creek Indian Lands. Elijah Fenn was the son of Travis and "Mary" and the grandson of Zachariah Fann - Elijah married Martha Rich, daughter of Stephen and "Abiah" Rich. Elijah's son John married Emeline Harrell and Elijah's daughter Letitia married Thomas Rich. Emeline named a son William Franklin Fenn in 1855. His wife Anna was called Annie. Annie's parents were Mary Ann Hendrick and Augustus Marvin Stone. Parents of Augustus were Sarah Davies and Benjamin Wilburn Stone. Ben was the son of Mary Polly Wells and Michael Stone who lived in Captain John Stones District of Putnam County Georgia. Parents of Mary Ann were Mary Ann Winters and C C Hendrick. Winters' parents were Amelia Lyle and Albert Winters, who married in 1816 Jackson County Georgia which was then Cherokee Nation East. During this era it was quite common to marry a native american and give them a Christian name. Anna Lou's baby was named Cecil Earl and he is only found in Texas census records for 1920 and 1930 during his military service first at San Antonio and then at Fort Bliss in El Paso. On the 1900 census Anna's son Robert is not listed so she may have been pregnant at the time and she may have also raised him but I have been unable to locate her on a census after she married or lived with Mr. Carter - she was very young and may have had more children with Carter. There are some possibilites with the census records but the woman is listed as black and widowed - then there is one Arnie Carter which could be Annie in Macon GA and she is alone, a laundress. Even so, in 1910 and 1920 there is no Robert listed as her son and the family knew him personally and he did exist and I found his tombstone by his brother Frank Jr. Then her son Arthur is not found after 1910 even though family says he married, had children, and died in his 20s. Cecil married Alice Emma McClain, sometimes referred to a Emily Alice or Ellie; she was the daughter of Lorena Emma Bozeman and Charles Allen McClain. 1900 census of Girard in Russell County Alabama- Ida may have been 14 or 15 when she married a man 20 years older - how and why I do not know - she was the sister of William and his second wife was much too young for him - hard to understand this family's traditions. 1910 Lee County - named a son Kapolem??? She married a mixed indian from Choctaw Nation Texas and moved to Creek Nation Oklahoma. Son of Annie and William was buried on brother Frank's farm beside him - this is the first time I have located our Robert on a census record. Family says he married after the war and lived in Chicago until just before his death. 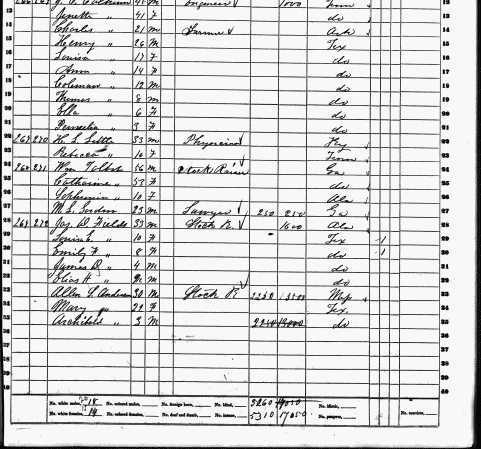 Grandpa Christopher took his family to Wood County Texas and perhaps he died there, unable to find him after this census record. Downtown Montgomery near the Train Station on Commerce Street which crosses Madison Avenue - William with his second wife and his daughter Carrie and his son Emmett who did work for the railroad. William died in 1922 and Emmett handled the paperwork. Downtown Montgomery near the Train Station on McDonough Street which crosses Madison Avenue - Frank worked for the railroad, shoveled coal into the fire- hauled prisoners of war - wife was Neva Mae Walraven - Frank told his children that the baby his mother took away was only a half sibling and that Carrie was also a half sibling creating quite a mystery for genealogists. Soon after this census Frank's father died and Frank Jr bought a large farm in Elmore County. Frank's children receives nice gifts from their grandma Carter and said they remembered Frank leaving on the train to attend grandma's funeral in Macon Georgia. 1850 Decatur Georgia, John and Emeline are at the bottom of this census page but their new infant son William is on the next page and they also live near John's sister, Letisha or Letty Fenn and her husband Thomas Rich - perhaps they married cousins. Jackson County Georgia census helps us with their ages and number of family members and it shows no slaves - Jackson County was once part of Franklin which was Cherokee Territory. Barbour County Alabama William with second wife, family called her Eva Dakota - she is younger than his children - son Arthur Lee died young - Carrie is not present so she could have joined her mother - Robert does not appear on census either but I did find his tombstone by Frank Jr. Family says that brother Robert moved to Chicago but came back to his brother Frank's farm. 1910 Montague Texas, brother of William and Madison married Lula and had a son named Thomas Jr.
Our great grandfather Charlie McClain's father came out of Georgia during the Civil War leaving behind a wife and children, who eventually filed divorce. The McClains originally were from Virginia, migrating into South Carolina, with the marriage of a Charles McClain to Elizabeth Moon around 1760 and she gave him several sons who migrated into Georgia long before the Trail of Tears. connects to Josiah McClain of South Carolina who's father was Charles McClain who might have been in the American Revolution; Charles had married Elizabeth MOON in Virginia around 1780 and then migrated into the Carolinas where their children were born. Josiah had James in 1810, John Milton, William Smith, etc. They all had many children. James named his son Josiah Marion McClain born 1838 who became my great grandfather thru his own son Charles Allen McClain. married Cecil Earl Carter and had three children, dying a few hours after birthing the third one. Thanks for visiting I am researching many of my grandparents. Hans Brooks of Holland and his son John Brooks born 1837 in Pennsylvania. John Baptist Bond, Caroline Bond and Thomas Smith, grandson of John Smith, Annie Clark Ballard, granddaughter of Larkin Francis Ballard, Rowena Densy Baxter, Peter Bozeman of the American Revolution, his son William Henry to Peter Edward, Elisha Anderson to Seaborn Montgomery Anderson, Lavinia Brack, Hester Doty, William Sellers, Charles McClain and Josiah, Gideon Moon, Elijah Lee, Andrew Cooper, Frank Cochran, Isaac Coonfield, Captain George Little of Scotland, Christopher Coonfield of Holland, Alexander Cochran of Scotland, Abraham Crigler, Lydia Carpenter, Polly Duval, Jesse Simmons, Kitty Stone, Hester Ward, James Young, Charles and Catherine Weatherford of Virginia, John C. Wright, John Wright Little, Reason Roby, John Fann of England, Zachariah Fenn, Anna Lou Stone, Frank Fenn, Augustus Marvin Stone, Mary Angeline Partridge and George Thornton, Milton Elijah Thornton, Bessie Mae Hood and Ella Olivia Baxley, and many more. Most believe the Boseman or Bozeman families came from Holland and this we may never know. Edword Bozeman was found in the 1790 census of Baltimore, Maryland; John in Talbot, MD; Lawrence Bouseman in Baltimore. Some served in the American Revolution and received a pension along with grants of land, for instance, the South Carolina Archives lists some as Gabriel, John, Paul, Jesse, Ralph, James, Mordecai and probably more with different spellings of our last name. Of course it would be nice to learn more about Mordecai even his middle name and if he was the son of Samuel Edward Bozeman and Mary White, after all, her brother was named Mordecai and the name Edward has continued over many centuries. So many names were Biblical yet then we find another set of Bozemans named Ralph, Fred, George, and Lewis. Names were so very special, most often, after another dearly loved family member. These families were farmers and many had well educated, successful careers, mostly throughout the South, as they explored each new territory as it became available. Reverend Bozeman did a marvelous job writing his "Sketches of the Bozeman Family" in 1885 and a couple of pages were scanned to share indicating the whereabouts of Mordecai. He does not say anything about Mordecai being a fatality of the Revolution so we can only assume that he died later from natural causes, and hopefully that information will come to light soon. The 1810 census of Darlington SC shows only four Bosemans, John, James, Peter and Chapman. 1800 shows a Thomas living in Somerset NC. The name Thomas is carried on through the next century. * From 1798 to 1819, a steady influx of Europeans into Alabama settled on land formerly occupied by several Native American tribes. Alabama became a part of the Mississippi Territory in 1798 after Indian cessions in north Alabama. Migration increased after the end of the Creek War in 1814. In 1817, the Alabama Territory was created, and Alabama became the 22nd in December 1819. PETER BOZEMAN was in Alabama on the 1830 census. Father of Lorena Emma Bozeman was John Thomas Bozeman. of William Henry Bozeman and Martha Hill of Darlington SC. William was the son of Peter and Sarah Bozeman. Fact, fiction or folklore, by the time the American Revolution was over, there were dozens of Bozeman families throughout the South. They resided among several different tribes of native americans and have many indian brides in their ancestral charts. In January 2008 the DAR has finally listed Peter Bozeman. Mordecai Bozeman born 1735 NC, while there were only a few colonies on the coast, while it was still Indian Nation and his son Peter born 1758 served in the American Revolution. Documents show that both were paid 4 pounds for their service. Nothing more is found on Mordecai but his son Peter moved his family to Montgomery Alabama about 1826 - 1827. His son William Henry is my connection. William and Martha Hill ( daughter of John Hill of South Carolina) had Peter Edward Bozeman who married Nancy Jane Anderson ( daughter of Lavinia Jane Sellers, who's mother was Lavinia Brack) and had John Thomas - John married Alice Lorena Stephens and had Lorena Emma Bozeman - Lorena married Charles Allen McClain, the only son of Elizabeth Broadway and Josiah Marion McClain. Their daughter Alice Emma McClain married a dark handsome Cherokee named Cecil Earl Fenn Carter about 1931 and had Anne Alice Carter in 1934. Cecil's parents were Anna Stone and Wm Franklin Fenn. Anne was orphaned at the age of 5 and lived with her McClain Grandparents. Anne Carter married Frankie Lavern Cochran in 1951. Frank was the son of Luella Ellen Coonfield and Frank Delbert Cochran of Chetopa Kansas and Frank had one eighth Cherokee blood. Luella's parents were mixed Cherokee, Lattie Cedonia Little of Kentucky and Benjamin Wallace Coonfield of Arkansas. Frank Delbert's parents were Clora Jane Miller of Illinois and Jacob Benjamin Cochran of Ohio. Clora's parents were Mary Clara Parker of New York and James Miller of Rockingham Virginia. Parents of Mary Clara were Rosannah Lemmon and Archelaus Parker, a son of Sarah Tefft and Archelaus Richardson Parker of Massachusetts and New York Indian Country 1600s. Anne Carter Cochran's daughter Kathy married Charles Wayne Brooks of Montgomery Alabama. His parents were Mary Ella Thornton and James Edgar Brooks. Mary Ella's parents were Bessie Mae Hood and Milton Elijah Thornton. Parents of James were Susie Mae Cooper and James E Brooks Sr. Parents of Susie were Sarah Elizabeth Carter and Levi Benjamin Cooper. Parents of Milton were George Thornton and a native american named Mary Angeline Partridge out of Georgia. Parents of James Sr were Annie Clark Ballard and John Edwin Brooks from Maury County TN. John's parents were Roxanna Permilia Smith of TN and John Brookes of PA and his family came from Holland. The Ballards were from North Carolina 1700s. Thus all of the Brooks children descend from many surnames including the Bozemans and Carters. Mysterious error on census, Lavinia Jane Sellers Anderson mistakenly listed as Bozeman, but note that she is the mother in law - she is Corrintha Anderson Barfoot's mother. Lavinia was the wife of Seaborn Anderson and also the mother of Nancy Bozeman in the next household. Lavinia's parents were Levinia Anderson and William Calvin Sellers - all the Andersons being of the same family of Elisha and the Sellers all being from 1700s North Carolina. Back with her parents she must have been pregnant with George when her husband died - Westbrook sometimes comes up as Westbrooks but it could be because of the loopy penmanship of the census taker. George Grauer and his father in law Mark Porter buying land in Marengo County and then the daughter of George, Elizabeth Westbrook buying 160 acres of her own in 1860 for herself. The story of Ben returning to Alabama is unknown. It is also unknown how he met our Aunt Carrie. They had only one child, a daughter named Dorothy and how her name is special to them, is another mystery to uncover.